Sorry to advise that the “Kaizen for Girls Academy” has been postponed until the New Year. We’ll let you know new dates as soon as they are confirmed. For those of you who have already paid the fee, we can hold the payment over until next year or provide you with a refund. Please email Kim, kaizenfootballoffice@gmail.com with your preferred option. In the meantime, have a wonderful Christmas break and we look forward to seeing you on the turf in the New Year. Following on from the successful launch of the Kaizen Academy in Upper Hutt earlier this year, we’re delighted to announce the KAIZEN ACADEMY FOR GIRLS. This is a four-week pilot programme at Maidstone Park Turf developed especially for females aged 13-18 (born 2000-2005). The programme is open to girls of all abilities – and you don’t have to be a current UHCF club player. In fact, we’d love to welcome college players who haven’t previously experienced a club training environment to come and give it a go! Kaizen – “The Practice of Continuous Improvement”. Kaizen Football Academies takes this ethos and transitions it into a high-quality football development programme that focuses not just on technical and tactical aspects, but the physical, psychological and social/emotional needs of the player to achieve their goals. It means whatever your goal or starting point Kaizen will encourage you to find ways to continuously develop skills, grow your confidence, get fit – and enjoy your football! Still not sure why you should give Kaizen a go? Read on! The programme is made up of four practical sessions on the all-weather artificial turf at Maidstone Park, plus a presentation session in the clubrooms for players and their families to review the programme and discuss next steps (date for presentation session TBC). Sessions are structured so that players at different levels are both challenged and can achieve. Kaizen coaches understand the importance of your specific needs. With your can-do attitude, we will strive for ways to do things better, improving every aspect of your performance. Plus of course, as well as helping to develop your technical ability, tactical awareness, mental endurance and social connections, football training is also a great way of developing a positive attitude towards fitness and emotional health with friends! Kaizen mentor almost 100 youth players across the greater Wellington region. And for those ambitious players keen to investigate other options through football, the Academy programmes collaborate with organisations that champion sporting achievement and talent pathways, engage and participate in respectable and challenging tournaments, overseas opportunities and community events. Where is the pilot programme being held? 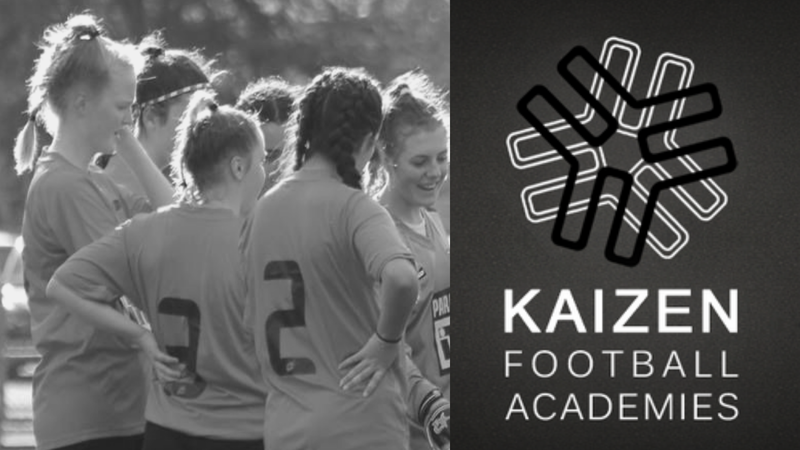 The Kaizen Football Academy for Girls will be held at Maidstone Park Turf, Park Street, Upper Hutt (opposite Mitre 10) on the weather-proof astroturf, with access to changing facilities, showers and toilets. There’s loads of parking, and it’s close to rail and bus stations if you’re coming from out of town. This is an exciting initiative for female youth footballers in the wider Hutt Valley region. We want it to be about so much more than just improving your football skills. It’s a great opportunity to become part of a community which shares a common interest in football, make friends who’ve got each other’s backs, develop your confidence, and of course, be happier and healthier too! Give it a go! We’d love to see you there! !